This ring wrap is perfect if you want a fancier version of the three stone ring. 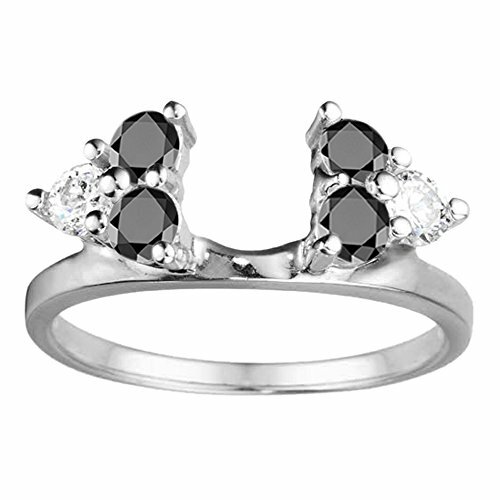 Three stones represent the past, present and the future which is why this style is so popular. This ring wrap will perfectly compliment any traditional style solitaire. This ring wrap is inspired by tradition but is certainly an upgrade from it. Each and every ring wrap sold by TwoBirch is custom made to fit your needs. We create your product based on the metal, stones, and sizes you select. While our items are created to fit specific solitaires, they can also be customized to fit your engagement ring. In order get this customization, you would simply need to contact us. We would need to know the width of the base of the bottom of your ring & at its widest point. If you are unsure of the proper measurements, then it would be best to send photos that show the top of the ring, the profile view of the ring and any other angle that shows the details of the ring. As always, feel free to contact our friendly staff to answer any questions you might have. After all, while creating a ring enhancer is easy, making it fit perfectly requires experience. At TwoBirch, we have over 20 years of experience in creating the PERFECT fitting ring enhancer! Will Fit Traditional Solitaire Round Cut from 0.25Ct to 1Ct , Princess Cut From 0.3Ct to 1Ct. Love the look but not sure about the fit? Add PerfectFit by TwoBirch onto your order by search TB-KT-0001 in the amazon.com search bar above. Hassle free returns. 100% satisfaction guaranteed. 30 Day Returns.